The Canadian Sport For life Stages of LTAD, No Accidental Champions Model (2006) illustrates the seven stages of long-term athlete development as well as the two additional stages necessary for athletes with a disability. Para NB – Sport & Recreation has a strong focus on the Awareness and First Contact stages as persons with a physical disability in New Brunswick need to be made aware of existing opportunities and have a positive first contact experience in order to continue to engage, participate and lead a healthy lifestyle. 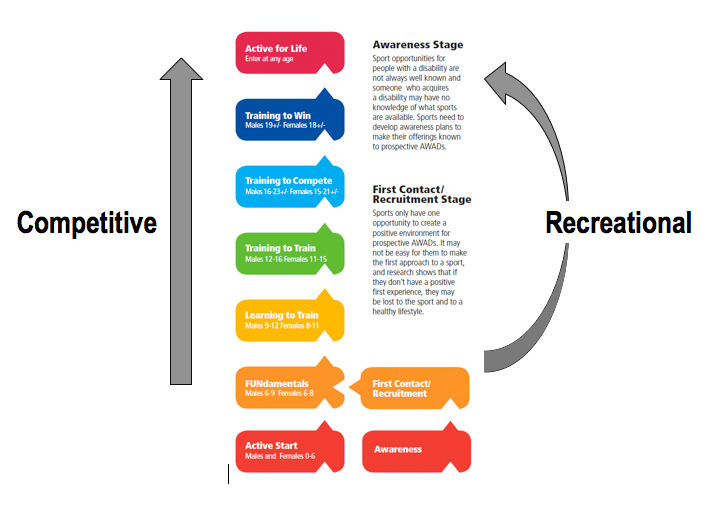 The road to the Active for Life stage of long-term athlete development has more than one pathway. These pathways can be recreational or competitive but a positive first contact experience and development of physical literacy are essential.